As Luxor Times was the first to publish about Dr. Mohamed Ibrahim talk concerning the new discovery in the Valley of the Kings (Here), we also have some detailed information about the discovery. Dr. Mohamed Ibrahim, Minister State of Antiquities announced on Sunday January 15th the discovery of the tomb of Ni Hms (Nekhmet) Bastet, daughter of Amon Re priest and Amon Re singer. The tomb dated to the 22nd dynasty when Egypt was rules by Libyan rules but Amon Re priests had the power to bury family members in the royal valley at that time. The discovery was made by University of Basel mission headed by Dr. Elina Paulin-Grothe and Dr. Susanne Bickel. 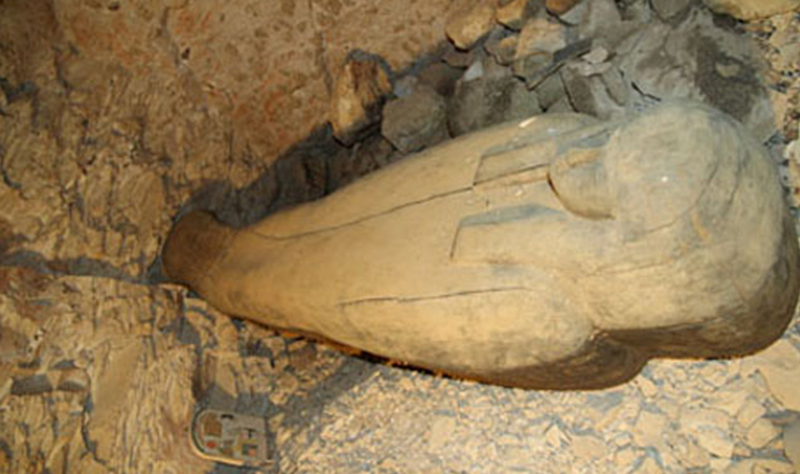 Dr. Elina told the reporters: "We were not looking for new tombs. It was close to another tomb that was discovered 100 years ago." Dr. Ibrahim mentioned according to the official announcement from the ministry that the mission discovered the tomb during cleaning task on the path leading to Tuthmosis III’s tomb. The minister also said that the well leads to the burial chamber which measures 3.2 by 4 meters, a wooden black sarcophagus measures 190cm x50cm x 50cm and a wooden tablet measures 27cm by 25cm, both decorated with hieroglyphic inscriptions showing the name and titles of the Lady Singer.